After so many years of selflessly educating and supporting our MEBO community, without receiving any compensation for her work, we are most proud to announce that the UK Medical Research Council (MRC) has granted a research Award of £358,000 GBP (equivalent to 422K/Euros or 552K/USD) to our esteemed and beloved Scientific Advisor, Dr. Elizabeth Shephard. 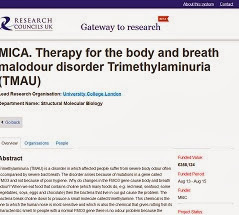 Details of the UK Medical Research Council funded "Therapy for the body and Breath malodour disorder Trimethylaminuria (TMAU)" has been posted in the Research Councils Gateway To Research Site. You can also access this award information by going to the RCUK Gateway to Research site, and typing in the award code, MR/K015494/1. Please feel free to read all about it, including the Abstract, Technical Summary, and Planned Impact of this research as registered with the Medical Research Council, UK. "Therapy for the body and breath malodour disorder Trimethylaminuria (TMAU). Spearheaded the nomination of Trimethylaminuria (TMAU) as a condition to be considered for inclusion on the U.S. Social Security Administration's (SSA) 'Compassionate Allowances list'. She submitted her nomination through the National Organization for Rare Disorders (NORD) with a packet compiled by Dr. Shephard and a representatives of MEBO Research in the US and the UK. Publications: Elizabeth A Shephard, PhD has published many articles in professional journals on FMO3 and TMAU throughout the years. On behalf of our international community, I would like to extend our most heart-felt congratulations and gratitude to Dr. Elizabeth Shephard for her invaluable service to our community, and wish her the very best in this research endeavor. We are at her beck and call to assist her in whatever is within our power. Our MEBO Public Relations Director, Karen, is in the process of organizing a worldwide MEBO Fundraising Campaign in support of this very valuable research. More information will be forthcoming in the near future as this project unfolds. 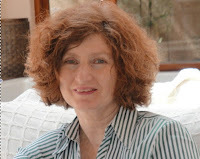 We have utmost confidence that any campaign Karen organizes will bear great results, as her Raising Awareness Campaign led to a compassionate outcome from the MRC officials, who directed her towards publishing her story, My body produces an offensively pungent chemical, in the Royal College of General Practitioners (RCGP), InnovAiT, Oxford University Press. InnovAiT 2012; doi: 10.1093/innovait/ins093 in the Oxford Journals of the Oxford University Press, InnovAiT. Now, MRC writes to Karen and other MEBO Directors who have supported Karen's campaign, to inform us of this remarkable research award. As a result of Karen's very diligent determination to march forward with our Raising Awareness Campaign, MRC has been very instrumental in introducing Karen to the proper authorities to work with UK DUETs, NHS Evidence, National Institute for Health and Clinical Excellence, to publish 10 body odor related uncertainties / questions, now found in the Library of NHS UK database, about the effects of treatment for TMAU. Now, MRC writes to Karen and other MEBO Directors who have supported Karen's campaign, to inform us of this remarkable research award. Volunteers wanting to join Karen in being a part this historical campaign for our community, are encouraged to contact MEBO at maria.delatorre@meboresearch.org, so that we may count on your time, talents, or treasure as Karen organizes this endeavor. I can't overstate how proud I am to be a part of this community! Is this the same study as Trinzyme. Or are there two studies going on?? Is there an estimated window of time( ex.1-3 years) for when this would be available to us for treatment?? I believe that the process to get a pharma in the market accessible to patients has to go through many phases, and ultimately, it has to be approved by the Medicines and Healthcare products Regulator Agency (MHRA), the European Medicines Agency (EMEA) and/or US Food and Drug Administration (FDA), etc. This costs millions of British Pound Sterling, US Dollars... Probably this MRC Award is intended for the first couple of years, at which time we would need to help find more grants to keep it going. Actually, we need to start fundraising as of now for the long term process. The point is that when the funds run out, then the only alternative is to turn to pharmaceutical companies to invest, which is something that we hope will take place later than sooner. The more the pharmas invest, the more expensive the therapeutic will be for sufferers to obtain because the pharmas are in it to get a good return on their investment. Therefore, it is to our long-term advantage to fundraise to supplement this research, so that it can move forward with full force. This will keep the price down later on when it's out on the market, and hopefully, it will expedite the process so that it goes out on the market sooner than later. I see. Fundraising is crucial. Are we set up to do that internationally? Sorry, I have accidentally removed my reply to the question, "Is this the same study as Trinzyme. Or are there two studies going on??" Basically, the answer was that Trinzyme is the same study. So the MEBO For Trinzyme Project is the fundraising campaign to support the UK TMAU Therapeutic Research Project for which the PI, Dr. Shephard received £358K research award from MRC. But the project will go on beyond what the £358K will cover, so MEBO has launched the MEBO For Trinzyme Project. More information on this project is forthcoming. Sorry I accidentally removed my previous comment. I think I will do a post soon putting together all the Q & As I've received in these comments and emails. Any updates on this research? Are they doing mouse studies? Do we know if trinzyme is a probiotic therapy? A treatment for fmo3 deficiency? Dr. Shephard tells us that an update will not be available until after at least one year of the research has been underway. Research is very painstakingly thorough and each detail has to me observed and meticulous documented. This process requires a great deal of time. Hopefully, we will have our first update after August 2014, depending on the outcome of this initial phase of the study. This is such exciting news... I used to be very active in the tmau community but had to pull away because I felt so helpless reading my same story over and over in others' lives. But this is the first morsel of hope for our community! Any updates for this month(one year point? Good question. We need to ask the researchers. Hopefully, we'll get an update soon. I hope this is successful. How do we get in touch with Trinzyme to get an update? An important thing to realize about researchers is that they customarily do not discuss their research, and they really don't like doing so, until they have finalized each research phase, at which point they present it in a professional manner in a publication. There is nothing researchers want more than to publish their findings in order to be able to obtain additional grants to go on to the next phase of the research project. They don't need for us to push them along, it really won't expedite matters any, on the contrary, our questions only take them away from doing their research work. The scientific method is a very tedious, long and meticulous process, and scientists cannot jump to conclusions or make declarations about their research until the method has been carried out in great detail. Therefore, our contacting the researchers asking for updates only serves to aggravate those very persons who are inspired to work to help us... This is very counterproductive. Every time they are disturbed by repeated requests for updates, when they've already explained that they cannot give information until their research phase is concluded, they are forced to stop their research work to reiterate their answer yet again. Each of these events only represents that we are annoying those persons who are inspired to help us! This must stop, and sufferers need to stop writing to our researchers and creating this unfortunate situation. They have already told us that they would be happy to let us know when they publish their findings as soon as their research phase is concluded in a very methodical and well documented manner. I know that sufferers are desperate, but persistently contacting researchers that are working to help us asking them to hurry up the process only works against us. We need to be patient, and we need to be grateful that they are researching to help us. It wasn't too long ago that there was absolutely no formal research taking place on TMAU or any other odor condition that we are aware of. It was only a few years ago that TMAU testing had been discontinued in the US for one whole year. It took MEBO volunteers a great deal of hard work to unite sufferers and experts to promote testing and research again. It will be counterproductive for us to now interfere with research by continuously bombarding our scientists with questions and pressuring them for answers. I understand. It's just that they commented on their website that there would be a progress/update after the first year. By the way who has contacted the researchers to get an update? Not me. And according to your own post above you mention that we need to ask the researchers for an update. I'm confused by your tone and I am sure I can speak for anyone afflicted with this disorder we do not take for granted this and any other ongoing research. Heck some of us even contributed funds towards it. It was also mentioned somewhere that there would be an update after a year into the initial research. Perhaps this was stated by the original pharmacist who discovered a possible treatment and got the ball going. Sorry for my tone as well, as I do appreciate all the work you do with this site, it just struck a nerve with me to think we are bothering researchers who don't suffer with this disorder on a daily basis and we should just be grateful that someone is helping. I believe we deserve that help. It has been a long time in coming. Sorry if my tone doesn't sound right, it was not my intention to confuse or offend. I know we were told, as I posted in this blog, that we would receive an update at the end of the year of the research phase. However, we have not received an update as we hoped. It's OK if our researchers take longer than expected, and I'm certain they have valid reasons. Unfortunately, they also have to pursue funding for the next phase at the same time they are carrying out their research, so it's my guess that the long process of filing grant proposals probably takes them away from the research itself. Everything takes time, unfortunately. I don't know who writes to the experts directly to get updates or to explain their personal situation in pursuit of advice; and I can totally understand the desperation on the part of sufferers. Nonetheless, I need to let everyone know that we can support our experts by freeing up their time for them to do the actual research as opposed to having to answer volumes of emails from sufferers. Perhaps there is no "softer" way of saying this, and it may sound harsh on my part, though it is not my intentions. I think that we could all work together towards this end, and I know you and everyone else want nothing more than to support research. Thank you for your input, and please take my reply to your comment as informational and as an attempt to find ways to expedite research as much as possible. It is not at all intended to sound accusatory or sullen. Also, anonymous, please note that I am also addressing many other people who have asked for updates. You are not the only one. I think that posting my reply makes it easier to reach everyone interested in this matter. Thank you for your input. Thank you for not being offended by my post. The key is we all need to work together and do our part. Thank you Maria for all you have done and are doing for us. Hi do you know if this project is complete or is it ongoing? I see that the project has been extended to January 2016. I am wondering if they will be giving an update soon or in January sometime. The scientists and MEBO have been trying to get funding for the next few years. Herbal Hill is one of those efforts. However, we are very much aware that we need serious investors, and that's where our primary focus is. This first phase of this research was a very good one, but more phases are needed to complete this. My name is Cardoso and I live in Rio de Janeiro, Brazil. Sorry if not expressed myself well, I'm using Google translator. I live in a prison TMAU call, I have 51 years and I still enjoy a bit of life left for me, since I lost my youth and my life is a daily torture. So I ask. There is already some esperimental remedy for TMAU? I'm sorry you have had to struggle with this condition for so many years. Trinzyme is still in the pre-clinical trial phase, which according to the research team, should end within 2 to 5 years. At that time, interested any pharmaceutical companies with interest in both primary and secondary TMAU can develop the therapeutic for clinic and subsequent sales of the product. This is the case as long as the research is not delayed and is showing that it is working with no dangerous side effects. I personally am more hopeful now than ever before. MEBO began organizing around 2008 in the UK when there was no research taking place and no hope in sight. It has been a few years already. Therefore, 2-5 years doesn't seem so far away now. "Other beneficiaries include pharmaceutical companies with an interest in both primary TMAU (inherited form and basis of this project) and the treatment of secondary TMAU (acquired form through e.g. gut bacterial overgrowth; bowel surgery; liver dysfunction). Our proposal is focused on primary TMAU but secondary TMAU results from an impairment in, or overload of, FMO3. Results generated from our studies will therefore impact also on a therapy for acquired TMAU. This industry would benefit from development of the therapeutic for clinic and subsequent sales of the product - this would be within 2 to 5 years of the pre-clinical study end." I continue to receive requests for updates on the Trinzyme project in this and other posts and sites. Each phase of the research process takes a long time, and there really isn't much news, except when funding is needed or obtained for the next phase. So, the reply for updates may sound repetitive - like a broken record. This is as frustrating to hear as it is to have to post it over and over again. Unfortunately, the current reply will continue to be the same until I write a post of any new turn of events. The scientists are still pursuing significant funding (approximately $10 million US dollars) for the Clinical Trials phase. They are pursuing government and private grants. Once that has been achieved, I will post about it and the news of the commencement of Clinical Trials. Until such time, my response will continue to be the same.